From the Institute on the Environment blog, Grace Becker details how MESA (Midwest Energy Storage Alliance) has transitioned from the Energy Transition Lab to the Clean Grid Alliance (formerly Wind on the Wires). Read more here! It’s akin to a moment every parent faces, says Energy Transition Lab Project Manager Barb Jacobs: letting go of a program or initiative, incubated and fostered inside of academia, to make its own impact in the world. It can be hard to let go, but with the right foundation and the right partners, it’s a transition that unleashes tremendous potential. IonE director Jessica Hellman recently returned from the 2018 Berlin Seminar on Energy Policy. 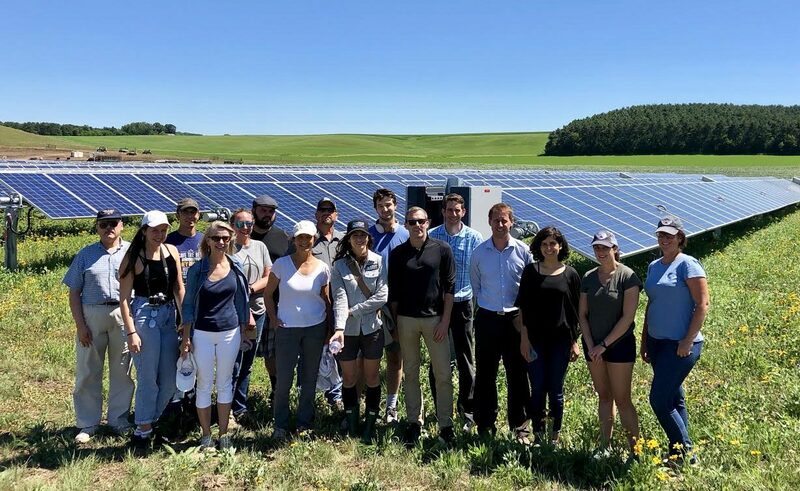 The seminar, facilitated by Sabine Engel, IonE director of international partnerships, brought a delegation of Minnesotans to Germany to learn about the country’s transition to renewable energy. To read more about Jessica’s experiences with the seminar, click here. Five IonE fellows, including ETL director Ellen Anderson, were recently awarded funding from the Legislative-Citizen Commission on Minnesota Resources (LCCMR) to work on sustainability initiatives. The $550,000 grant that Ellen received will go towards a project on community-scale energy storage for renewable energy. To read more about this project and the other IonE fellows’ LCCMR funded initiatives, click here. On December 1, 2017, the University of Minnesota Law School co-hosted an event with the Nicholas Institute at Duke, UNC’s Center for Climate, Energy, Environment and Economics, and Harvard Law’s Environmental & Energy Law Program. “Managing Dynamic Change in the Midwestern Power Sector” is part of the Power Shift Series, which convenes experts in the academic, business and government sectors to discuss grid changes, pose related legal questions, and foster a research agenda for power policy reform. You can read the proceedings here. Participation in December’s Power Shift included ETL’s Ellen Anderson. This blog was originally posted on Climate Generation’s website. The Energy Transition Lab’s Ellen Anderson is a member of UMN’s official delegation, as well as a member of the Climate Generation delegation, to COP23. As I write my final blog of the week, I’ll focus on two topics. First, to conclude the 100% renewable energy discussion, I highlight Vaxjo, Sweden and Costa Rica, as well as an important research paper. Vaxjo is Duluth’s sister city, and they share a similar population around 90,000 and an outdoorsy setting with beautiful lakes. Vaxjo’s lakes were heavily polluted in the 1970’s, and the search for solutions led to a political decision in 1996 to go “fossil fuel free.” The city now produces about 66% of its energy from renewable sources, including for heat. Besides energy efficiency they make use of abundant forest products to produce bioenergy. Costa Rica is on its way to 100% renewable electricity by 2030, and adding other sector goals. Minister William Calvo said they were paying fossil fuel companies not to produce power, which is an interesting approach to compensating for stranded assets. Earlier this week the Lappeenranta University of Technology and the Energy Watch Group presented a new study which models a global transition to 100% renewable electricity. Hans-Josef Fell, a former member of the German Parliament, explained this modeling is unique in that it modeled hourly energy demand, and showed that existing renewable energy potential and technologies, including storage, can generate sufficient and secure power to cover the entire global electricity demand by 2050 – or sooner if a supportive policy and regulatory framework is in place. Today is “energy day” at the U.S. Climate Action Pavilion, which was funded by Michael Bloomberg to fill the gap left by the U.S. government’s absence. This is the first COP in history in which the U.S. has not hosted a pavilion to share information with COP attendees. This morning I learned about new software that can solve an important grid issue. Researchers have analyzed energy data from our regional grid operator, the Midcontinent Independent System Operator (MISO) and found that even with a large and growing share of wind energy, there are many times of the day or night in which the grid emits high levels of greenhouse gas emissions. See a recent University of Minnesota Institute on the Environment research paper on this. This is important for users of energy storage batteries and electric vehicles. New software can automatically program energy – for charging stationary batteries or EV’s – that is both cheap and low-carbon, using real-time automatic analysis of what marginal resource is on the grid. As one speaker said, this is a clarion call for open data. Without access to grid utility data, we can’t field this software. Europe & North America have this information available to a certain extent but other countries don’t. As India moves to ban internal combustion engines, it will make an enormous difference in meeting Paris Agreement targets whether users are charging them at low-carbon times or not. The software developers claim that using this program in the US will be equivalent to taking 8 million cars off the road in terms of carbon reduction. There is so much else I would like to write about, but I’m out of time. This week has been an amazing amalgam of ideas, inspiration, and examples. Today’s talk by former Vice President Al Gore covered the spectrum from the stark scientific and meteorological data – crushingly dire and depressing – to all the reasons for hope. A global transition to clean energy is not only possible but inevitable. This continuum describes my COP23 experience, as I depart Germany imbued with more knowledge, information, and examples, and more hope for progress. Today I spent my day at a conference at the German Environment Ministry, just 2 train stops from the COP23 meeting. “The Local Dimension of the NDCs: 100% Renewable Energy” was co-sponsored by the Ministry and organizations committed to 100% renewable energy target. One sponsor, ICLEI, is a global network of 1500 sustainable cities including Duluth, St. Paul, and Minneapolis. The predominant theme of the day was that local community-scale activities on carbon emissions and renewable energy are the most important strategy to reach the Paris Agreement NDC pledges, and that 100% renewable energy is an attainable target over time. Harry Lehman, a leader in the German government who has visited Minnesota several times, commented that Germany’s greenhouse gas emissions reduction of 35% is an accomplishment given the challenges Germany is facing. He talked about the next challenge in renewable energy, in which “big” players could…click here to continue reading. There are so many different levels at which you can interact at COP23. My goals in attending were 1) to share the story of Minnesota’s clean energy leadership as a successful model, 2) to help explain to the rest of the world that thousands of Americans at the city, state, corporate, university, and individual level are still moving forward toward the Paris Agreement goals, with or without the support of the federal government, and 3) to learn as much as I can from the incredible resource of people here, in ways that will benefit our energy transition work at the University of Minnesota. There are some 25,000 energy and climate experts from virtually every nation in the world here and more events than you can possibly attend. Today, I...click here to read more.